In my last post, we continued to explore the ministry of Elisha by looking at 2 Kings 4:18-27 where we learned about the Great Women’s Sorrow. In this post, we learn about a Second Great Miracle in the life of this Great Woman in 2 Kings 4:29-37. The woman and the servant must have ridden very fast to get to Mount Karmel in time for Elisha and Geichazi to return home with her the same day, and the animal must have been exhausted from such a strenuous trip in the harvest sun. Why did Elisha send Geichazi ahead? He was probably the younger of the two men and could run faster and get to the house much more quickly. It was important that somebody get back to guard the corpse so that the father would not discover it and have it buried. Geichazi laid his staff on the boy’s body, but nothing happened. (Was this because of what was hidden in his heart?) The woman rode the donkey and Elisha followed after her, but we are not told that he received special power as Eliyahu did when he ran before Ach’av’s chariot (1 Kings 18:46). Once again, the door was shut on a miracle (4:4; and see Luke 8:51). First, the prophet prayed, and then, following the example of Eliyahu (1 Kings 17:17-24), he stretched himself out over the corpse. He got up and walked in the room, no doubt praying and seeking God’s power, and then he lay on the boy a second time. This time the boy came back to life, sneezed seven times and opened his eyes. The text does not explain the significance of the sneezes unless it was God’s way of expelling something toxic from his lungs. You would think that Elisha would have been overjoyed to take the boy downstairs to his mother, but instead, he called Geichazi, who in turn called the mother. However, the story does not end there. We will meet this Great Woman again in 2 Kings 8:1-6 when Elisha announced the coming of a seven-year famine, he also advised the woman to relocate, so she went to dwell with the Philistines. When she returned to claim her property, Geichazi was speaking with the king and telling him about the resurrection of the boy, and his mother showed up in the palace! The king authorized the officials to return her property to her along with whatever income she had lost because of her absence. The death of the boy turned out to be a blessing in disguise. Only God’s grace can impart life, whether to a barren womb or a dead boy, and only God’s grace can impart spiritual life to the dead sinner (John 5:24; 17:1-3; Ephesians 2:1-10). 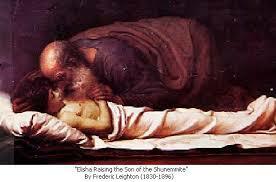 It was God who gave the boy life, but He used Elisha as the means to do it. So, it is with raising sinners from the dead: God needs witnesses, prayer warriors, and concerned saints to bring that life to them. In my next post, we continue to explore the life of Elisha. In this post, we learn that Grace Removes A Curse in 2 Kings 4:38-41.